Above: Young callipterus inspecting some line we just laid down. Our dives have been going well, and we’ve been seeing tons of cool stuff. Unfortunately the guys on the team can’t stay under as long as the girls (a tank of air only lasts so long with our bigger lungs), so I haven’t been able to contribute as much as I’d like. Nonetheless, Adam, Joe and I have been able to stay down an hour or so the last few dives, and we’ll probably be able to last longer when we’re sitting still on the bottom doing observations. In any case we’ve identified a ton of N. pulcher groups, set up some transect lines, and started to catch fish for some other studies. This morning we met with the Head Man (chief) of the nearby village, as well as some of the villages advisors, and secretary. All were very friendly and very interested in our work. The head man even made a joke about how their village was much like our fish in that they had a lot of extended family members around. Yesterday we all went to Mplungu to pick up some research supplies and other equally important items (cookies and beer!). In the market Connie picked up some eggplant which was integrated into our delicious dinner last night. In spite of it being delicious, dinner last night was quite the event. After our dive we had gotten things put away quickly as an imposing storm was clearly approaching fast. 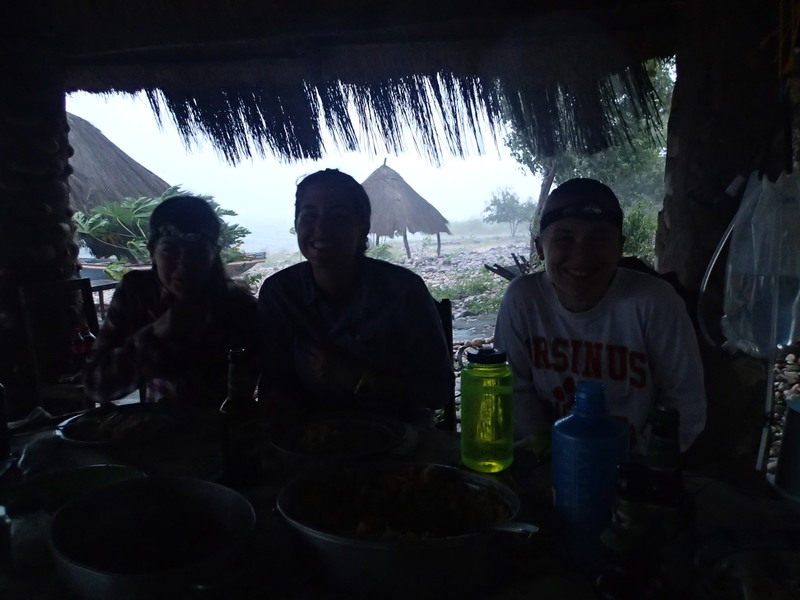 We assumed dinner would be delayed because of the weather, but instead we dined in the pouring rain with gusts blasting water through the shelter. We all managed to have a good laugh about it however. Below: Connie, Kelly, and Jenn enjoying a rainy dinner.